Top notch audio quality with a long lasting battery, but an unfortunate loose fit and hefty price tag. Plantronics is part of history; the Federal Aviation Agency selected the lightweight headsets as the standard sole provider for air traffic controllers in the mid 60's. Neil Armstrong's first words on the moon were transmitted through a Plantronics headset. 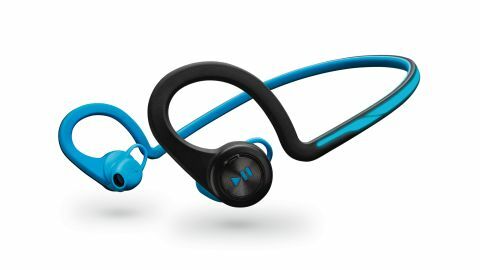 The company's new product, the $129.99 (about £81.73, AU$149.84) BackBeat Fit, is specifically designed for the perspiring athletic types out there, including "sweat proof" P2i coating that protects from any potential moisture malfunctions. At 0.8 ounces, its lightweight and flexible enough to go unnoticed but detailed with a reflective finish for runners' safety in the night. It also comes with a threaded case that can be strapped to your arm, holding your iPhone or smaller Android device in place. The electric blue accented headband is rubbery, with one side smooth and the other grainy. If it weren't for the seemingly vulnerable plastic ear buds, the whole headset could be tossed around. The durable and flexible rubber lining is built for rough workouts. The band has a reflective surface, assuring safety for runners in the dark. Despite the loose strap, BackBeat Fit's ear buds fit securely and comfortably in place, with the ear-hooks contorting perfectly around the ears' helix. The headphone's soft rubber tips look alien in appearance but slip gently in the ear, fitting without intrusion. The secured slot for the microUSB jack is nicely placed in a hidden compartment on the rim of the right ear bud. There's a slit for your fingernail to pull it up from its rubber cover. Sleek buttons on the outside housing of the ear buds control everything from volume to Bluetooth pairing. On the outside housing of both ear buds are two buttons: one large enough to take up the whole surface area, and another tiny protruding button on top of it. You'll tap the little button on the left ear bud to up the volume - hold it down to lower it; press the big surface button on the left ear to pause and play, hit it twice to skip a song. If you get a call, the large button on the right ear pushed once picks it up. The pouch that comes as a holder for the headset can be inverted inside out and be used as an arm band and soft case that you can tuck and zip up your iPhone in. Plantronics also tries to conserve the BackBeat Fit's battery. When it's out of range of your tablet or phone, it goes through its "DeepSleep" power-saving hibernation mode. The BackBeat Fit will last two weeks on standby, with eight hours of listening time and six for talking. The maximum volume feels "safe" - it's good enough for most, but it's limited to those wanting ear splitting audio. High intensity work outs like running to Electric Light Orchestra's "Twilight" weren't loud enough to be able to get into the "zone." There is enough sound bleed to maintain situational awareness. Despite limited volume, there are very little problems pertaining to the quality of sound. Bass, mid and treble frequencies were all perfectly balanced, giving a full spectrum of rich, beautiful audio. Those wanting heavier thumps of bass may find that other headsets deliver more powerfully due to the BackBeat Fits lacking low-end frequency. Voice call quality is standard; not extremely crystal clear, but audible enough to hear your caller. Occasionally, if you listen closely, the Bluetooth connectivity may drop for a fraction of the second. I found that getting really close to my iPhone caused a bit of confusion with the device, as if it comprehended that level of proximity to be, at times, unfathomable. The more frequent you use the device, the less this will happen, and the more it will become adjusted to the distance. There is no doubt that the BackBeat Fit delivers outstandingly on battery life, a true reflection of the quality that Plantronics delivers. Even after two days of being left on standby and occasionally used for music, I was still able to play music at full volume for eight straight hours. The full array of audio is beautiful and bursting with a full spectrum of sound for each track. This makes up for the lack of a hard-hitting bass and a capped volume. The very flexible and rubbery material of the entire headset is incredibly durable and gentle. The small detailing of the reflective strip that aids in visibility when its dark out is an appreciated subtle touch. The constant bobbing of the cord that wraps around the back of your neck isn't very comfortable. The only thing that secures the headphones was the over-the-ear hook and buds implanted in your ears themselves. The Bluetooth connection disconnected twice randomly; I had to re-sync the device in my iPhone 4's settings. This may be a result of first time use or my old phone, but it's recommended to keep your BackBeat Fit close by (or in the same room) to avoid any potential drops in connectivity. For some, the button functionality may take some time to learn. It would be nice to have a more dedicated volume up and volume down button, versus the singular button for volume control. The $129.99 price tag is steep, but shows in the high quality audio output for songs, the immense battery lifespan and the durable and flexible material of the headset itself. This is a Bluetooth headphone set that is made for the athlete. If you're more focused on your workout than the potentially annoying bobbing and slack from the back of a loose band, this may be for you; the secure fitting of the ear hooks and nestled tips will keep the headset in place otherwise. Albeit rather basic, the reversible carrying case that transforms into an armband phone sleeve is a nice touch of the overall package of the headset, great for those on the go that need to secure their phones. The biggest selling point of the BackBeat Fit seems to be the investment in the longevity of the product itself; it's definitely a headset that feels as if it can last for years. It boils down to asking yourself the following question: are you willing to accept a durable Bluetooth headset with beautiful sound and super charged battery life despite its high price point, weak bass and an unwieldy strap?